It used to be the place where youngsters would go to buy sweets – but now it is a burned out shell. And now, residents and community leaders want action to save the building on Main Avenue which was affectionately known by locals as the lollipop shop. At present, the building is boarded up at the front. But the view from the back is of a devastated structure with an open space where once there was a roof. In the past it has attracted fly tipping, say locals. Frank Arrowsmith, a former miner who now is now on Edlington Town Council, said: “Until a couple of years ago, the frontage was just wide We managed to persuade the council to board it up to improve the appearance. “But it burned down in 2011. It had been empty, and had been the subject of antisocial behaviour for some time before that. “In 2011 it was burned to shell – it was a fierce fire that took seven fire engines to put it out. “Edlington Town Council has been campaigning for Doncaster Council get a grip on the situation. Its got to the point that we’re worried about it getting infested with rats and mice. The roof space is already full of pigeons. It is a prominent location when you’re coming into Edlington. We’re concerned about how it looks to people, but also about health issues. Fellow resident Jim Mourning, who is also on Edlington Town Council, agreed. He is concerned that its putting people off bringing their businesses to Edlington. 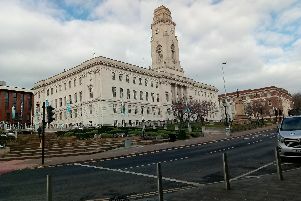 Doncaster Council says it is looking at what could be done with the building in the future.